Obesity is a major health problem in this era, which gives you many accompanying Projects like diabetes, hypertension, cardiovascular diseases, stroke, etc, Bariatric surgery or say weight-loss surgery has been very much accepted in last decade and has undergone various research for the more and more Procedures. It has been recently recognized that weight reducation surgery modifies the metabolic and hormonal states too which are associated with comorbidities. * It is not just a syndrome, but it is a cluster of diseases which are acquired due to imbalance in the hornnal structure of the female genital system. *In polycystic ovarian disease, ovaries become polycystic when they are stimulated to generate more and more amounts of androgen hormones specifically testosterone. 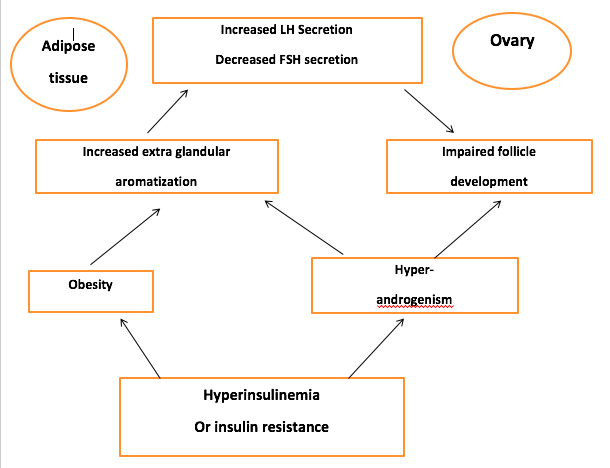 Below Figure summarizes the pathophysiology of PCOS. If we see some brief about PCOS or PCOD, its most accepted name is due to its presentation on sonography examination of poly (multiple) cysts in the ovaries. They (cysts) are Immature follicles in realty. The development of the follicles have stopped at an early antral stage due to ovarian dysfunction or arrested function.